Presently, there is emerging research interest regarding coach education and its impact on the learning and professional development of sports coaching practitioners (Chesterfield et al., 2010; Townsend & Cushion, 2015). However, female’s engagement (or not) in sports coaching and formal coach education is currently a vastly under researched area (Cunningham, Sagas & Ashley), and the number of females who have attended formal coach education courses via the FA in the United Kingdom (UK) remains modest at best (Norman, 2012). Unfortunately, little empirical research currently exists which examines female’s experiences of formal coach education, or coach education in general, particularly within football. Moreover, as Schlesinger and Weigelt-Schlesinger (2012) contest, ‘we do not know exactly why women keep away from the associations’ coach education programmes or do not take on coaching positions’ (p. 58). To that aim, it is anticipated that this chapter will provide an insight into this shortfall. Therefore, following the guidance offered by fellow researcher (e.g. Mercier, 2001; Norman, 2008, 2012) that scholars of sports coaching related research should begin to expand their sports coaching investigations beyond that of ‘typical’ male populations, the primary purpose of this chapter was to explore from a deeply critical sociological and gendered perspective, the issues female football coaches face when exposed to the associated complexities of the formal coach education process. The existing research base which considers this state of affairs is modest at best, and as mentioned previously there is a dearth of empirical investigations that have examined female’s experiences and associated issues within formal coach education. This chapter therefore presents an ideal opportunity to explore female football coaches’ perspectives of the value, impact and equality of the FA formal coach education, specifically focusing on gender discourse. Crucially, it was visualised that any developments would build a foundation of recommendations to be considered and endorsed to enhance the FA’s formal educational process. First and foremost, a brief overview concerning the underrepresentation of women attending formal coach education, in addition to relevant contemporary issues, is addressed. Following this, an analysis of coach learning and the theoretical framework is presented. The research study that this chapter entails, incorporated a Bourdieun theoretical framework. 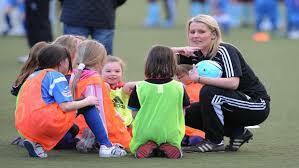 Purposeful sampling was employed to attain the 10 female football coaches to take part in semi-structured interviews. Following on from the data collection, the results and key findings were highlighted and discussed, in relation to the appropriate existing key literature. To conclude, a summary and recommendations were provided to close the chapter. Hopefully, these recommendations will enhance the process and experiences of female football coaches, and ensure that they have the same equal opportunities of male football coaches to develop professionally and enhance their learning, as well as improving their coaching pedagogy and practice. If you would like to purchase the Sport and Discrimination Book, please find it here.